The National Park of Gran Sasso and Laga-Mountains, with his 150 thousand hectares of ground, embraces 44 Communes, 3 Regions, 2 different and imposing Mountain Chains, welcomes a flora of variegated of evergreen trees, endless expanses of beech trees, white firs and chestnut trees, woods populated by a fauna of wolves and chamois, skies ploughed by wandering hawks and royal eagles. An ancestral landscape, rich of roaring and imposing falls, glaciers and perennial snows, imposing rocks and sweets brooks, studded of strengthened suburbs and of rustic cottages in which the tradition and the time are stopped to memory of past customs, in which the wild nature embraces man’s work in playful and reverential harmony. The green heart of Italy embraces three great Mountainous Groups, the Gran Stone, from which the Corno GRande polls with its altitude of 2912 m of altitude, entertains the Calderone, the most southern european glacier and the artificial Lake of Campotosto. Trekking- and trekking to horse-lovers, variegated meeting for enogastronomia lovers, the National Park of Abruzzo becomes crib of refined persons craftsmanship works, typical products of undisputed quality as the Pecorino of Farindola, the Mortadellina of Campotosto, the Chestnuts of Laga, the lentils of Santo Stefano. Easy to rich both from the Tirrenico-slopes and from Adriatic Coast thank to heighways, joined thrugh the Heighway of the Park, that from Rome goes to Teramo and passes in the tunnel of Gran Sasso Mountain – A24 – or with the fork for Pescara – to enter the south-eastern side of the park. You can reach the parts that own to Marche and Lazio with the Salaria Road. From Prati di Tivo you can easely reach the hut per lift. If you want you can folder the traces of the path, which lies to the right of the lift, till you arrive to the Fonte Cristiana. Go freely until you find an easy dirt higher, which passes under the lift and ends on the top the Arapietra Mountain. Go along the Madonnina and folder the path go up left in large bends to enter into the great Valley of Crows. Go Through the Pass of Scalette, than the path goes through massive rocks (Look at the arch that lies between twoo of them), till you reach, going left, the rock that cats the valley into two parts. Continue on hairpins and between rocks, then go left to the Fraschetti Mountain Hut. There you have a wonderful sight on eastern wall of the Little Horn. Brief route with great sights. From the Hotel of Campo Imperatore, pass the Observatorium and follow at the left the trace that cuts the southern side of Mt. Portella. Go along some rocky walls, then go up to the Portella Pass. Go left (west) and go up and down easy terrain and keep attention, till you arrive to the base of the rocky sault. From here continue over grass climbs. Let the wall to Top Malecoste at your left, and go up to the top ytrough path traces and easy little rocks. Take a sight of this wonderful panorama and you’ll understand the famous of this place. Route with wonderful sights, that let you see, during clear days, Mt. Velino, Mt. Vettore, Mt. Terminillo, the Laga Massive, the Campotosto-Lake and the Gran Sasso Massive. Park your car near to the Lama-Maountain. From here starts a dirt, follow this till you join a cave, then after a few hairpins abandone it to follow a path. This-one climbs right and continue till the top of the mountain. Go east, till you arrive to the Wall of Rotigliano, than go down to the Pass of Belvedere. Go through the Paradise Valley, left, and go up the wall that divide it from the Wall of Hell. After this, you will find, at 1700 m altitude, the A. Panepucci Hut. From the hut follow the dirt that comes to a road, going down on the west. It passes through the northern wall of Mt. St. Franco and arrives after 4 Km to the national way 80, not far from the auto-parking. The northern wall of Mt. Camicia, climbed the first time in 1934 by Bruno Marsili e Antonio Panza, ist surely the strongest and impressionant wall of the Appennini. The chosen route permits to arrive to the wild amphitheater that lies the Great Wall to feet. From Castelli go to Rigopiano. Pass the Art College of Ceramics, then pass through the little neighbourhoods of St. Rocco and St. Salvatore, till you arrive to a bend at your left, near to the Rustico Hill, where the path begins. The route passes through a forest and arrives to a little highland, then comes to the little river of Fosso Morto, and then goes up again. Pass another cave, where lies the Fountain of the Lords. Go trugh grass fields and you will arrive to the gravestone of Piergiorgio de Paulis (alpinist of Aquila, who fell during the first winter climb of the northern wall of Mt. Camicia), and a few steps later the rock with the plate dedicated to him. When you cross the path of the 4 Vadi, go through the snow field till you arrive to the cave that the impressionant wall to feet. There is danger of rock fall and you have not to go near the wall. 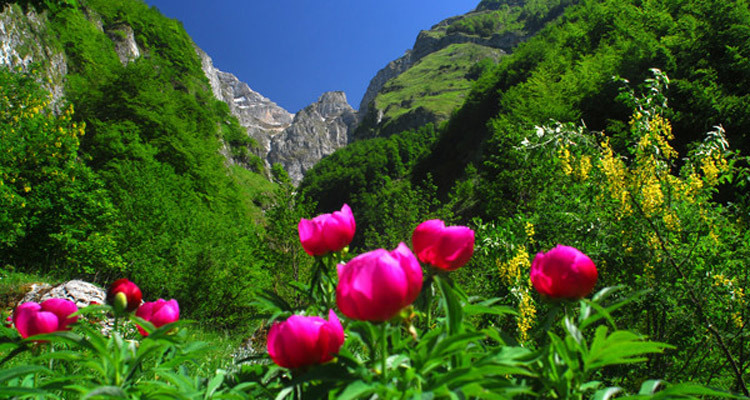 The National Park of Majella, was born in 1991, on a ground of 74095 hectares into the green heart of Abruzzo. The terrain is mountainous and embraces 3 Provinces, 6 Mountain-Communities and 39 Suburbs. The massive and round form of Majella Mountains is characteristic: it seems a grandiose elliptic dome, it dominates the landscape of Abruzzo raising between the sea and the Appennini chain. The western side, deprived of valleys, is ploughed from ample ston caves that go up to the forests that dress the slope, while that oriental side is milder. Besides the Mt.Amoro, the highest mount of the Majella Massive, 2795 m, there are about thirty mouonts that overcome the threshold of the 2000 m.
You can read some trekking routes that explore the wild and variegated nature of Majella National Park. Easy wander route to discover one of the most suggestive hermitages of the Majella Massiv. From the little round of Roccamorica you come to a fork near to a gravestone for fallen soldiers (signs for St. Spirit). At the fork enter the right street that passes along the cemetary, after a few meters. Before a bend, near to a building, a path starts and goes to south. You touch another house that lies left, from where you can still see the street. Go along the path that starts to let the street behind, and at a fork, keep attention not to enter the street that goes to the Cerasoli Canyon. With the help of a compass and a map it’s easy remain on the dirt, that arrives to 3 buildings after a bend. Contunue untill a 90 degrees bend, that arrives to the bed of a little river, without a chance to lose the right street. After a few metres, at 650 m of altitude, pass through the Rusci Canyon, and keep attention not to lose orientation, go to south and you’ll find the path again a pretty fountain. Go on for 600 m, till you find a fork. Choose a little path on the right, that goes down, that will bring you to the hermitage if you follow the signs. Pass through Piano delle Felci, then go down to the St. Bartolomeo Valley and the Capo Lavino Stream. At this point, you cannot loose yourself, the path is signed and there are a great number of crossen along the route. The Hermitage lies in the Valley, and you che see it after some stairs dug in rock. THe pèlace has an exstraordinary calm and beauty. Go down to the bed of the river and keep water from a quell. The Hermitage is always opened. On northern ends of the Majella ridges, deep valleys, that go down to Serramonacesca, hide one of the noblest monuments of Abruzzo, St. Liberatore Abbey. The building rises on the ruins of an Abbey of the IX century, which was destroied by an earthquake in 990 amd rebuilt at the beginning of the XI century. Start in Serramonacesca, that lies at an altitude of 276 m, walk along the street to Roccamontepiano, pass a bridge till you arrive to an asphalted street. Enter this street right and continue till you arrive to some colonial houses (Garifoli and D’Andrei). At the end of the neighbourhood, the street climbs and becomes more ruined. To your right you can see the abandoned and spectacular Pollegro Tower. Go along the street without reaching the tower, and go down a road that lies right. At the end of the street go along a field and follow traces of the path till you arrive the ditch to feet. Ford the ditch and climb north-west till you find a path that will bring you to the dirt road at the base of the valley. Follow this street and arrive to the Abbey of St.Liberatore a Majella. Visit the church and ask the Serramonacesca’s priest for the key, then follow the street that climbs to the suburb. You can turn right in the region Brecciarola to see the sugestve ruins of Castelmenardo. Wanderful route, you can make for the greatest part of the year, that let you see the wild Orfento canyon. Interesting are the erosions of the bed of the valley, the dense forests and the lucky chance to meet the territorial fauna, bucks, roes and bears. You have the Vivaio Forestale of Cerramaico to ask for permission. From Ceramaico Terme climb the brief asphalted street that brings you to the thermes and to Santa Croce, where you can park your car. Pass through the town, let the church to your left and follow a path that coasts along a vineyard, passes through a little river and arrives to a little bridge at a fork, on an altitude of 680 m. Go left along the slope of the canyon, then the path goes down to ythje Orfento-Valley, near to a courious pinnacle of buildings. Close to them you’ll find a little brigde. Go left, orographic right of the river, then pass another bridge that let you join the wildest part of the valley. After a serie of big stones, pass through a beautiful bend of the torrent that carved the rock. Go up into the forest, at half coast. Pass a secondary valley, climbing very much, and go straight till a fork: left, a few steps will bring you to the Ponte di Pietra / Stone Bridge (991 m), that salts a deep and spectacular forra. After the bridge a path brings you to a torrent, that lies the forra to feet, a spectacular place of great suggestion. When you come again on the southern part of the bridge, go up on a dirt till a hairpin, where you can see the Monte Focalone Wall, that closes the valley. From that point you can’t enter the valley. The dirt turns west at half coast and arrives to the nice plateau where the closed Hut La Cesa della Forestale lies, on 1105 m height. Continue on the road till you touch a source. Pass trough two hairpins, then you will touch the ford of St. Antonio, reached by a dirt from the slope of Caramaico and St. Nicolao. Don’t follow the street and go down to the valley that lies under, followind a path that goes down. At a fork go right. Go down along the wide underlying slopes, where you can’t see the path. Then, without reaching the suburb of St.Nicolao, enter an ample valley, right, that’s crosses, from the east-side, by a good path. After a house, you can find the outskirt path again from the litle bridge, from where you’ll come again to the starpoint in the village. It’s the most walked route between them that goes up to the Majella top. From Passo Lanciano go with the car till the Blockhouse, where the road ends near to a fountain and the signed paths start. From here follow the path number 1, that crosses the slope in its middle holding the top to your right, or climb to the top meeting the ruins of a Borbonic Fort. The 2 paths join again after it. Follow the path touching Mt.Cavallo. A few steps later, right (2118 m, wood cross) you can see some signs on the rock, carved by thiefs. The place is known as Thiefs-Table. You can reach the Acquaviva Sella (2100 m). In this part keep attenton not to loose the path that’s signed with number one, that crosses the slope. In one and a 1/2 hour you arrive to Mt.Focalone, and from the top you can admire the wonderful sight over Mt.Amaro. From the Focalone go down to the First Gate, that is 2568 m high. The path goes under Mt.Rotondo and in a few time arrives to the Third Gate. Then continue with a fatiguing and and uncomfortable path till the end from the highland that joins Mt. Pescofalcone and Mt.Amaro. From here the path takes an ample bend right, revolves an enormous dolina and then folds gradually to south east, onthe wide back that brings to the top of Mt.Amaro.